What: 12-week Beginners' Course + 4-week extension, totalling 16 weeks. When: Every Wednesday 7:00pm - 8:30pm starting 2 August 2017. Where: Darwin Squash Centre, 6 Marrara Drive, Marrara. Cost: $300, which will include: your own uniform, sword, and sword bag; as well as annual membership to the national organisation, which covers injury insurance and allows training and participation in formal events (such as gradings, competitions, and seminars) anywhere in Australia. 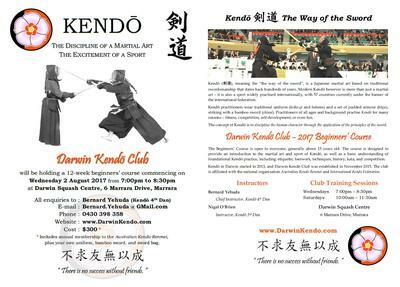 The Beginners' Course is designed as an introduction to the exciting sport and martial art of Kendō, meaning the way of the sword. Kendō originated from hundreds of old swordfighting styles, undergoing decades of evolution before being established as the modern sport as we know it today. With 57 countries affiliated under the International Kendo Federation (FIK), Kendō is steadily growing everywhere, enjoying over 1,200 practitioners in Australia alone. Kendō is practiced in a safe environment, utilising a bamboo sword and a full set of armour that protects the four target areas. The design of the equipment is based on traditional samurai armour and weapons. • History, concept, and principles of Kendō. • Etiquettes, stances, footwork, strikes. • Sword techniques, covering both attacking and counter-attacking. • Competition, covering both individual and team matches. • Advanced training exercises and techniques. We intend to align the end of the Beginners' Course with a public seminar, sponsored by the national organisation Australian Kendo Renmei, which allows the members with the opportunity to grade, compete, and study under high-ranking teachers. Members can then continue to work towards more advanced grades, as well as participate in various Kendō events and competitions around the country, in particular the annual Australian Kendo Championships which is scheduled every Easter weekend.